Cornhill Castle is a charismatic castle which occupies an elevated position overlooking the upper River Clyde, set against the dramatic backdrop of Tinto Hill and we are only 2 miles away from the quaint little village Biggar and only 10 miles away from a world heritage site in New Lanark. The venue is perfect for; weddings, small intimate gatherings and private dining to celebrate that something special. We have a couple of great options for your ceremony whether it be in our pavilion or in our stunning grounds surrounding the hotel. Your guests can enjoy grounds for your drinks reception whilst you get your all important pictures. We are sure you will love the wedding packages we offer, these include a red carpet on arrival, wedding co-ordinator, toastmaster, silver cake stand and knife and many more plus a complimentary stay in the stunning bridal suite. 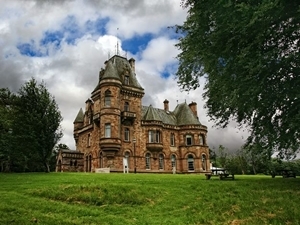 The Hotel offers a mixture between Georgian and Victorian accommodation overlooking the river Clyde and Tinto Hill. Every guest room has a bath and shower, a plasma TV, mini fridge as well as many other features. Now that we are under the Manorview portfolio we are sure we will take great care in keeping our castle on the Clyde as quirky and quaint as it is but also offer something new and different to Biggar and its surrounding areas. We are keen to retain many of the original features including spectacular stain glass windows and existing fireplaces. Whether you are joining us for business, pleasure, an event or allowing us to be part of your special day, our experienced team will ensure that your event is seamless. Sorry, but we have no upcoming events for Cornhill Castle Hotel. If you know of an event taking place at Cornhill Castle Hotel or anywhere else in Lanarkshire tell us about it and we'll list it on the website, for free!